First – why are modern day researchers using the Munsell chart (or similar charts) instead of the Holmgren wool test and the Lovibond tintometer? When it comes to the tintometer, it is rather cumbersome to carry around for field linguists travelling around the world, though its modern day equivalents, the colorimeter, is a huge help in many other fields. A field linguist needs something portable and rather sturdy. The wools would certainly fit that description, but the coloring of the wool is not standardized. By following Holmgren’s instructions, one would indeed get a rainbow of different colors – but two different researchers might get slightly different shades of red or green, and it would be very difficult to compare the results, because slightly different stimuli would have been used. What the Munsell chart offered researchers was just that: comparability, and it led to a great revolution in both linguistics and anthropology. In 1956, Lenneberg and Roberts published an article on how anthropologists might compare sensory descriptions in different languages. The general procedure would be to show the same set of stimulus materials to speakers of different languages and see if, and how, they differed in their responses. Color was an excellent choice for this kind of study, they suggested. By this point researchers knew that the physiological aspects of color vision seemed to be universal, and it was relatively easy to test, at least compared with, say words for pain or words for smells (interesting modern day research projects are investigating these domains at the moment). Lenneberg and Roberts decided to study color terms in English and Zuni, and chose the Munsell Book of Color (1942) to do so. There were several other color books available, but none were both as comprehensive, accessible, well tested (psychologically and psychophysically) and with detailed colorimetric information as what Munsell offered. 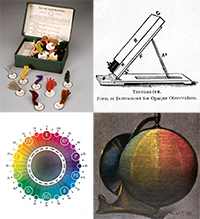 The Munsell Book of Color mapped all color samples it offered onto the color solid, i.e. the three (hue-brightness-saturation) dimensional theoretical construct devised by Nickerson & Newhall (1943) to show all human visible colors. 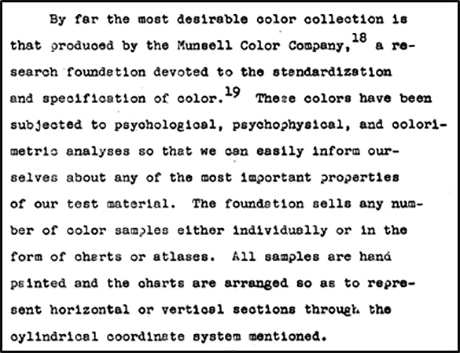 Quote from Lenneberg and Roberts 1956, page 43, detailing why they chose the Munsell Book of Color over other similar products on the market. Lenneberg & Roberts might have been first to use the Munsell Book of Color, but the most famous example of color linguistics is the work by Berlin & Kay in 1969. 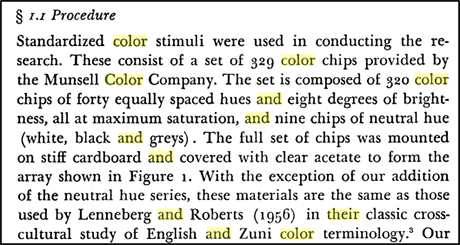 They investigated how speakers of 20 languages described 329 color chips provided by the Munsell Company. Berlin & Kay created an experiment kit composed of 320 color chips of forty equally spaced hues and eight degrees of brightness, all at maximum saturation, and nine chips of neutral hue (white, black and greys). Speakers were shown the colored slips of paper (pasted onto a neutral grey background) one by one, and asked to name them. The languages were Arabic (Lebanon), Hungarian (Hungary), Swahili (East Africa), Bulgarian (Bulgaria), Ibibo (Nigeria), Tagalog (Philippines), Catalan (Spain), Indonesian (Indonesia), Thai (Thailand), Cantonese (China) Japanese (Japan), Tzeltal (Southern Mexico), Mandarin (China), Korean (Korea), Urdu (India), English (US), Pomo (California), Vietnamese (Vietnam), Hebrew (Israel) and Spanish (Mexico). Berlin & Kay 1969 description of the Munsell procedure. Monolexemic (non-compositional). Its meaning is not predictable from the meaning of its parts. Not basic: blueish, lemon-colored, salmon-colored, the color of the rust on a car. Its signification is not included in that of any other color term. Not basic: crimson, since it’s correct to say that crimson is a kind of red. But red is not a kind of anything else. Its application is not restricted to a narrow class of objects. Not basic: blond, since it refers only to hair. Psychologically salient. If speakers are asked to list colors, the basic ones always appear early on in the list and denote the same hues. “Second, in the history of a given language, encoding of perceptual categories into basic color terms follows a fixed partial order.” (page 104) This echoes back to Rivers (1901) findings, but Berlin & Kay’s system was far more detailed. They suggested two variants of the universal order. These orders mean, that if a language only has two color terms, it will divide the entire color spectrum into two chunks, one for all blacker and one for all whiter colors. If there is a third color term, the reddish part of the color spectrum will be given its very own term. If there are four color terms, languages have a choice: either they can first name the yellowish part of the spectrum, or the greenish – in the next (five color term) stage, whichever of the yellowish and greenish parts weren’t named before, will be given its own term. Then blue, then brown, will be named. After that, languages, in no particular order, will name the purple, pink, orange and grey parts of the spectrum. Part 4 of the series takes a look at the World Color Survey and statistical data about language and color. Geiger L. (1868). Ursprung und Entwicklung der menschlichen Sprache und Vernunft vol. 1. G. Cotta’schen Buchhandlung, Stuttgart. Gladstone WE. (1858). Studies on Homer and the Homeric age (3 vols). The University Press. Heider ER. (1972). Universals in color naming and memory. Journal of experimental psychology, 93(1), 10. Rivers WHR. (1901). Primitive colour vision. Popular Science Monthly, 59, 44-58. Magnus H. (1880) Untersuchungen über den Farbensinn der Naturvölker: mit einem chromo-lithographischen Fragebogen. Fischer. Nickerson D. and Newhall SM. (1943), A Psychological Color Solid. Journal of the Optical Society of America 33:419-422. Seebeck A. (1837) Ueber den bei manchen Personen vorkommenden Mangel an Farbensinn. Annalen der Physik 118.10 177-233. Wilson G. (1855) Researches in Colour-blindness: With a Supplement on the Danger Attending the Present System of Railway and Marine Coloured Signals. Sutherland & Knox, 1855. Mikael Vejdemo-Johansson is a mathematician, postdoctoral researcher, programmer, system administrator, photographer and amateur musician. He received an Fil.Mag. (M.Sc.) in Mathematics at Stockholm University in 2005 and doctorate from Friedrich-Schiller-Universität Jena, Germany, in 2008. Since then he has been at Stanford, the University of St Andrews, KTH and the Jozef Stefan Institute as a postdoctoral researcher. Susanne Vejdemo is a PhD student in the Special Doctoral Programme in Language and Linguistics at Stockholm University. The goal of her PhD project is to try to determine what kinds of semantic content have an effect on the speed of lexical change, and to present a theory about the relative importance of semantically-triggered change, in contrast to such factors as psychological forces, sociocultural forces, cultural/encyclopedic forces and other linguistic forces. Posted by Mikael Vejdemo Johansson.